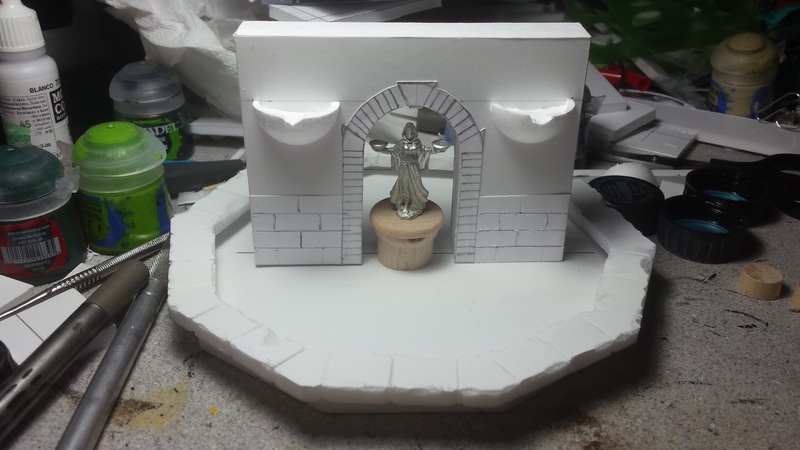 I came to a stop on the Well of Dreams and Sorrows awhile back, when I started trying to figure out the proper way to make my waterfall basins. I really wanted them to be round, but I was having trouble making them from scratch and I couldn't find a part that would work instead. But then, while I was at Hobby Lobby for something else, I discovered some 1" wide smooth foam balls. Instantly I knew that was the answer and I picked them up. 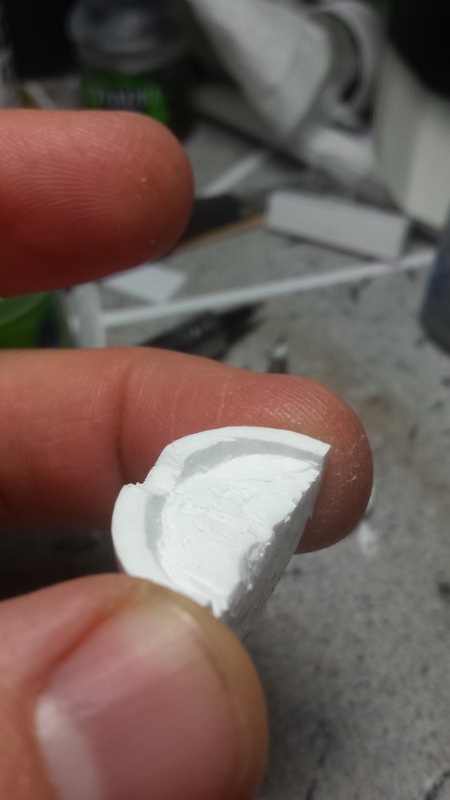 After cutting a ball into quarters, I then started gouging out a part of the interior to form a lip on the top. This will let me put some dark paint and crackle paint in them to simulate cracking and thawing ice. But before I can do that I need to sculpt some spouts on them as well. Without spouts, the water wouldn't actually work as a waterfall and instead would capillary down the bottom of the basin instead. With the basins sorted, for the most part, it was time to get cracking on the rest of the centerpiece. The centerpiece was already mostly constructed, but there were a few things left to do on it. 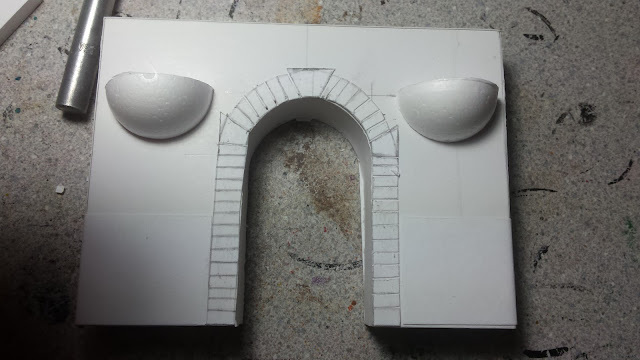 One of those things was cutting out the lines for all the brickwork along the bottom and the archway. I had started it before, but the day I was working on it and quit I was sick and hadnt had any luck with figuring out the basins yet. So I stopped what I was doing and left it sit. The fountain laid on the table as I then went to work on the Colossal Skeleton Battle followed by Sophie's Space Station. But now I was back to work on it and make all the cuts in about a half hour. With the brickwork made, I started on the top. Which was finished with a couple pieces of wood acting as a crown molding. To hide the seams between the two pieces of wood and the centerpiece, I covered it with a bit of card stock. This will bepainted to look like granite and hopefully I can hide the gap between paper and wood. The last thing to be built for it was the round toppers. I changed the design a little here and adding some round discs as pedestals for the balls. 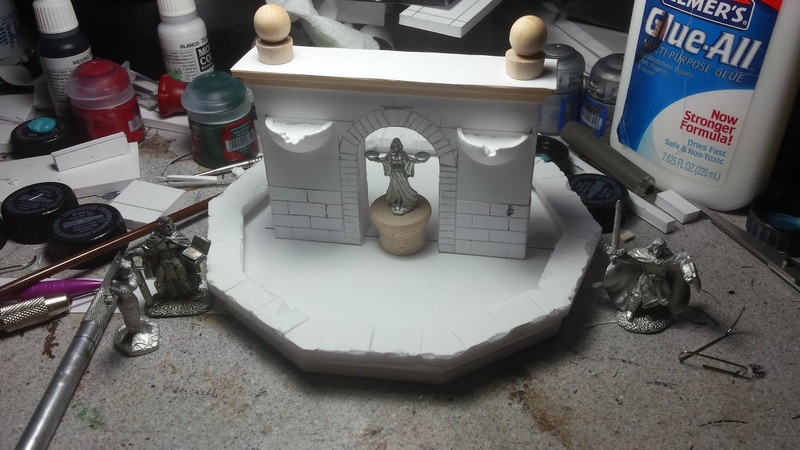 That's it for the build, except for making the spouts for the basins and the statue's base. That should be done soon. Then I can get to work on painting everything. - All brick work, waterfall basins and the crown section will be painted as granite. - the wall and pedestal for the statue will be painted as black marble. - the statue will be painted as weathered brass, similar to the horseman statue. With that all painted, the water will be done with icy water in the basins and the main fountain area. Water won't be falling down the basins. Instead, I am going to hang icicles from the spouts in various lengths. Which means I need to research how to do that. Either way, this project is moving along again and then I can move on to another piece for the Frostgrave table.